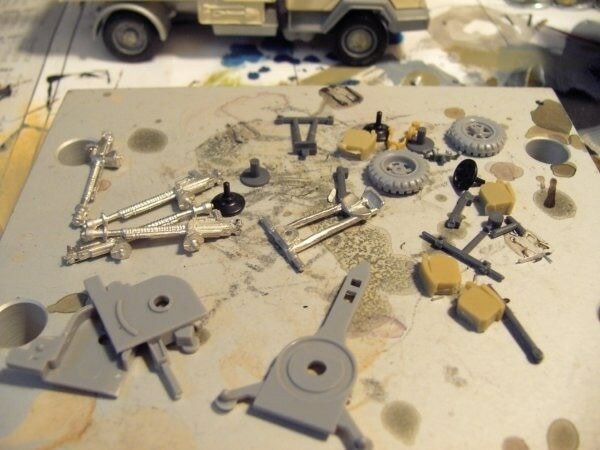 Here are the hows and whys of Technical Construction, along with some source material from which to base your vehicles. 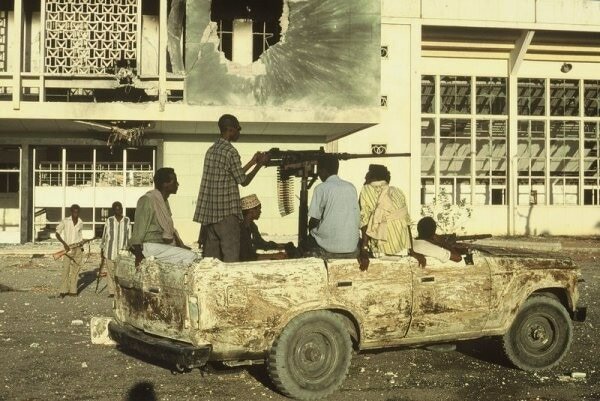 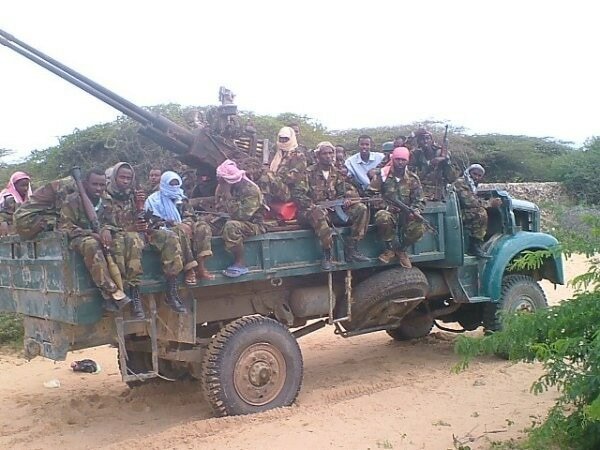 After seeing Blackhawk Down in the theater, I started doing some research into the U.N and U.S. involvement in Somalia. 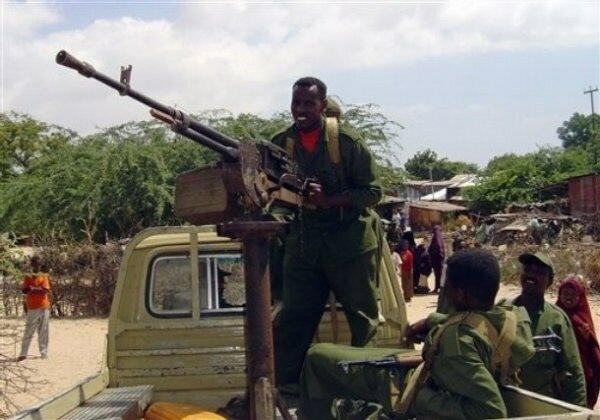 I found the conflict, along with the reasons behind it and the factions involved, to be fascinating and it became an area that I wanted to try to game. 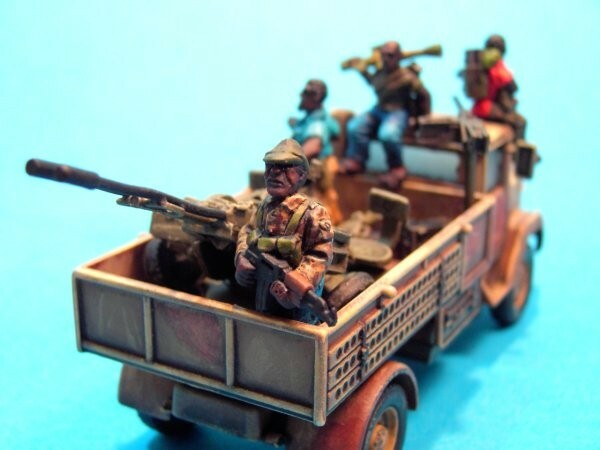 Relatively soon, TAG, Devil Dog Design, Britannia and MoFo had released lines of figures and the group I belong to began purchasing and painting Rangers, D-Boys and Somalis. 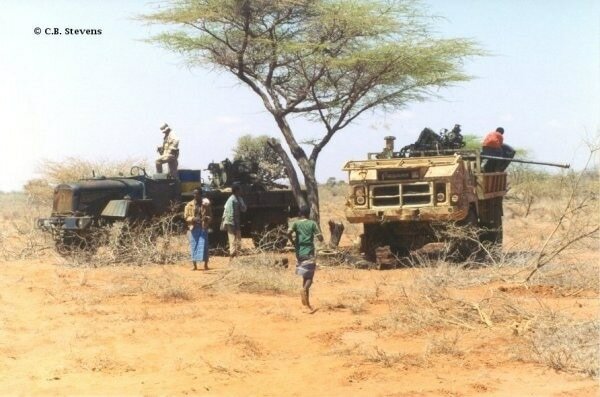 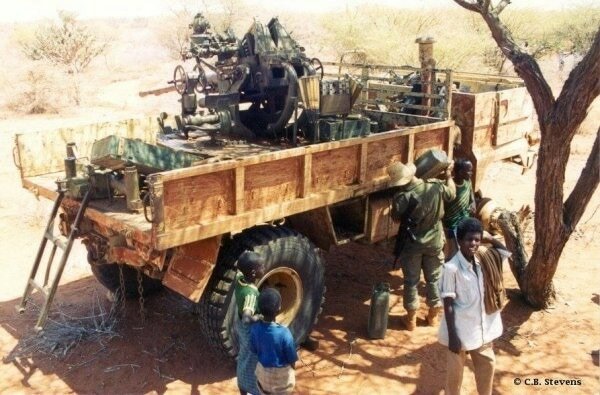 One of the things I had found in my research were a large amount of visual information on the ‘technicals” used by the Somali Warlords’ retainers and I decided that we needed some for our games. 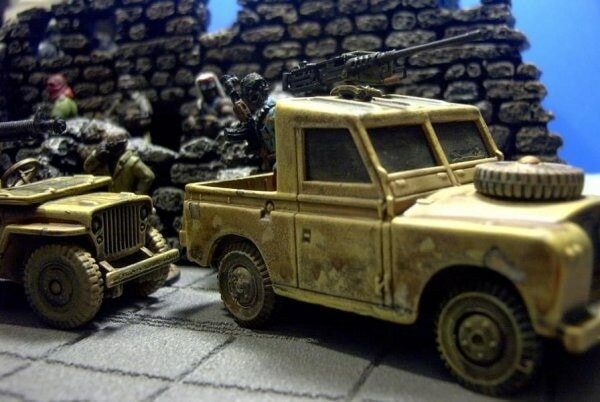 The first vehicles that I found were a jeep from Corgi (package scale but close to 1/50th) and a 1/43rd scale Corgi Land Rover. 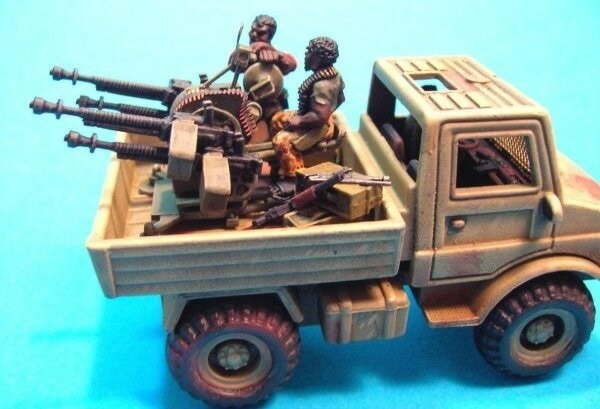 ​I then started on a quest to find some Toyota Pick-up trucks (bakkies to some of you) through E-Bay and found out quickly that there wasn’t much out there in 1/48th scale (the scale I would have preferred to use). 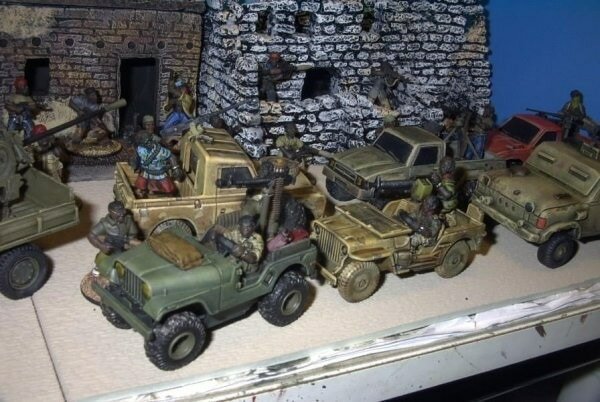 There were some items in 1/43rd scale but most were way too big. 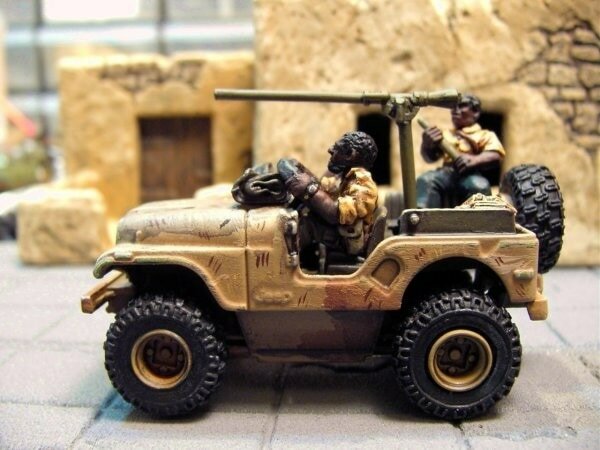 However, I found that a French company named Majorette had Toyota pick-ups and Land Cruisers in 1/56th and a Jeep CJ model in 1/55th. 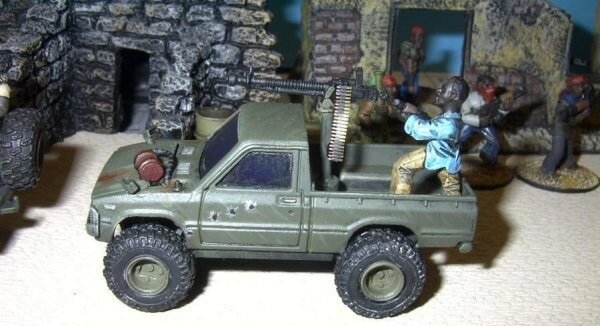 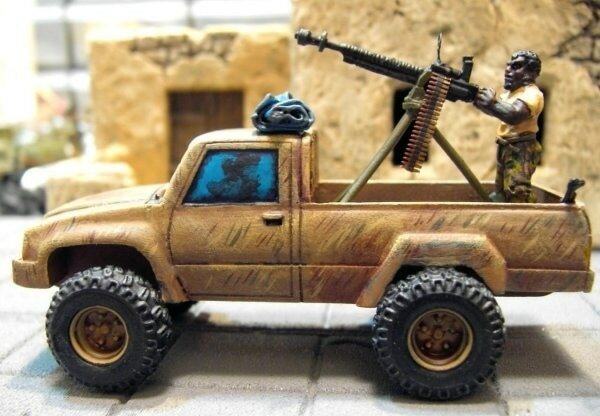 I also found the Force of Arms made a nice 1/56th scale Toyota along with crew figures and heavy weapons. 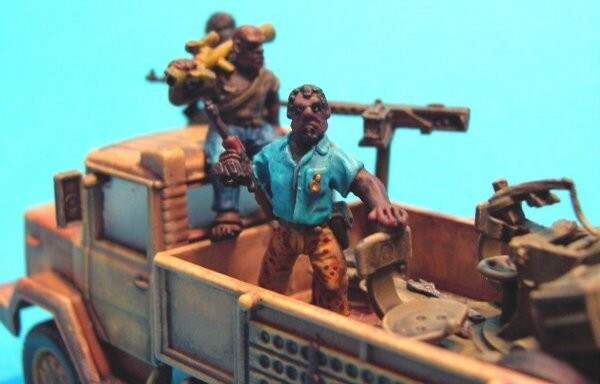 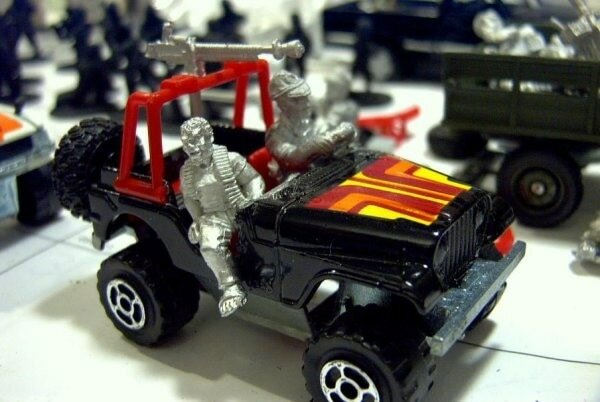 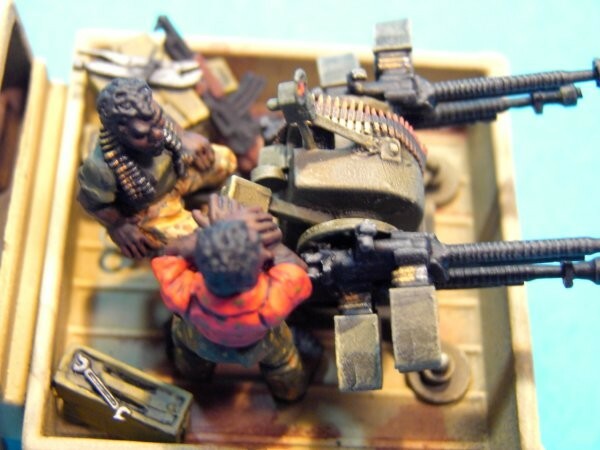 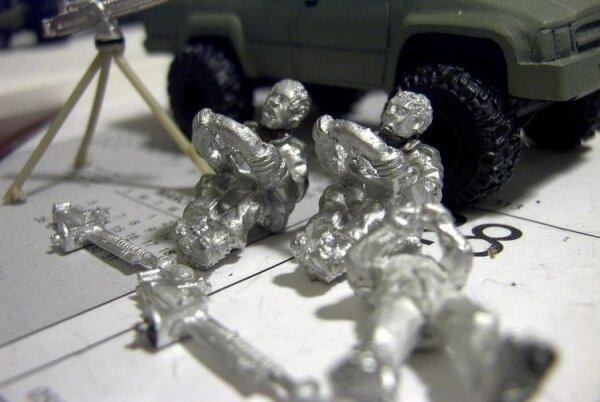 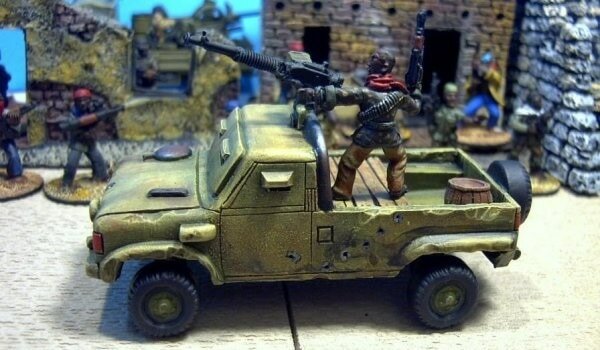 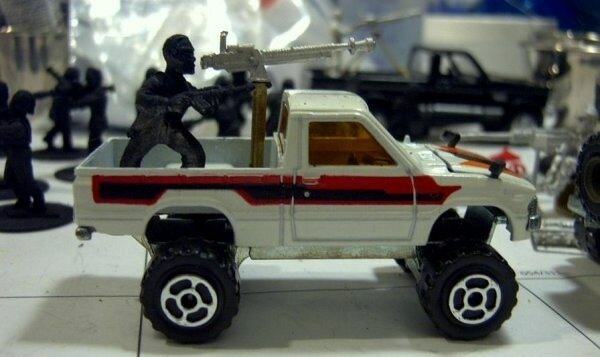 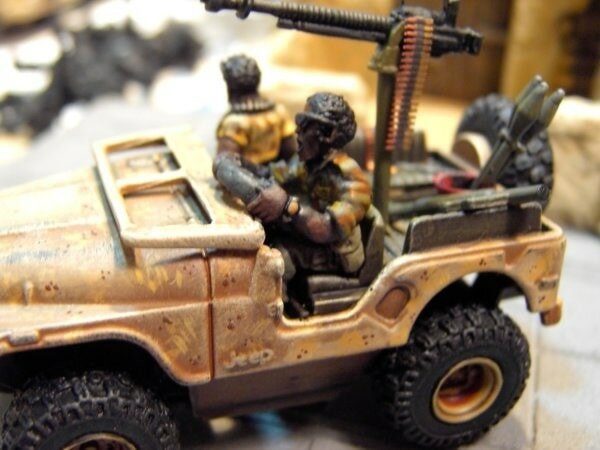 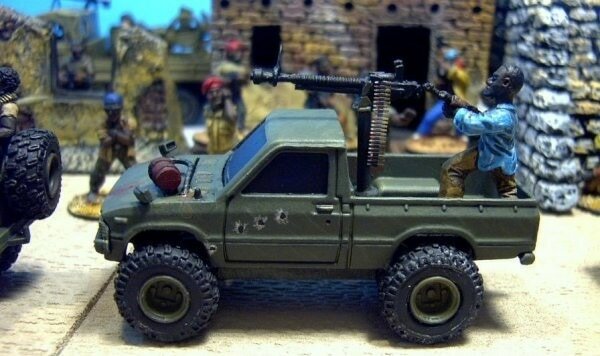 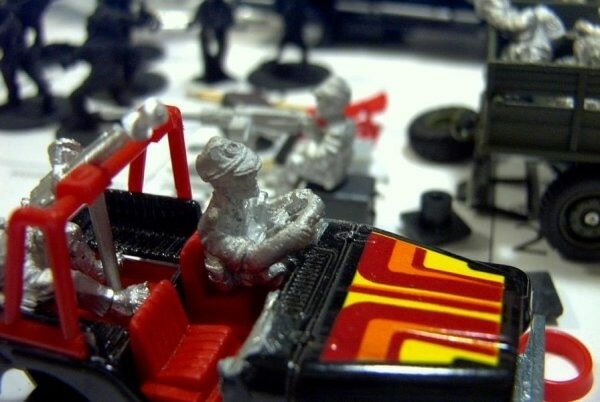 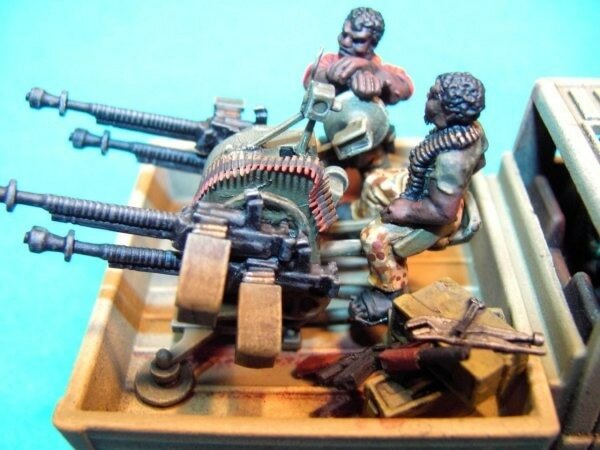 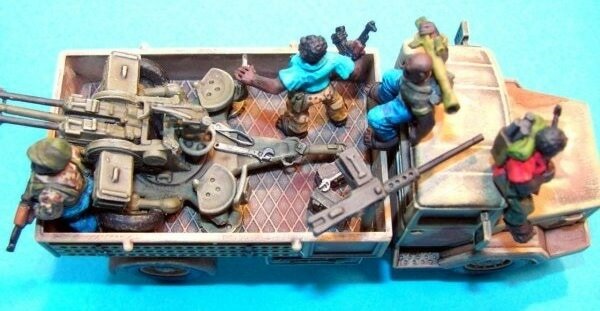 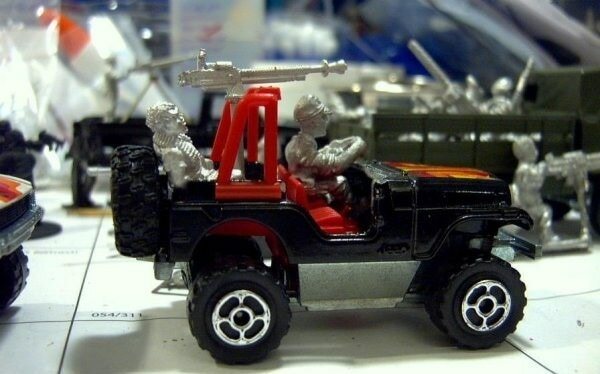 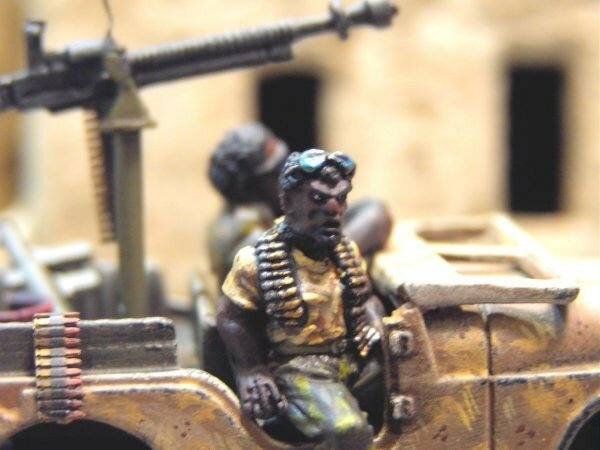 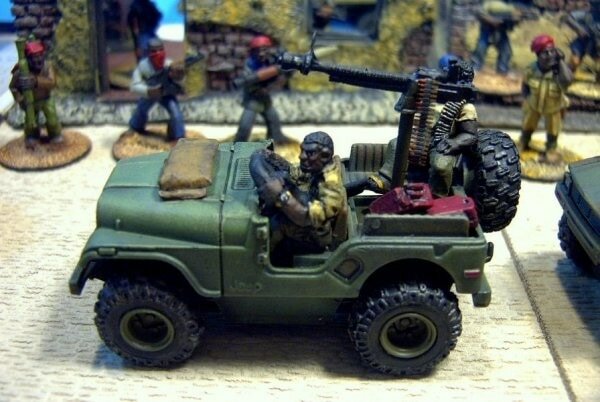 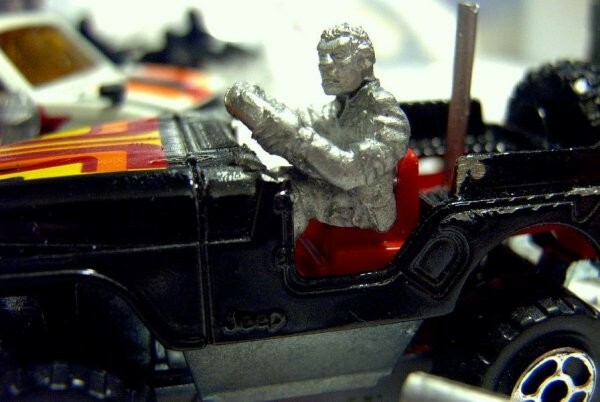 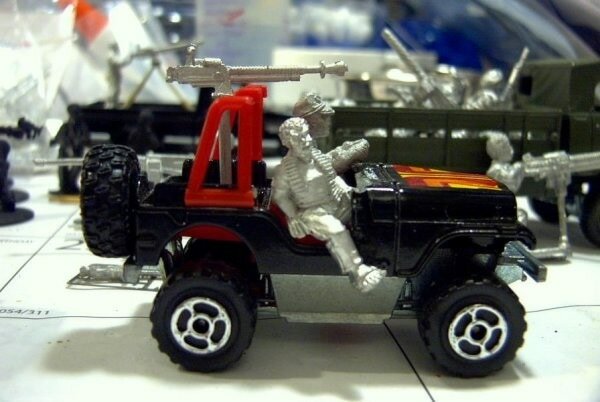 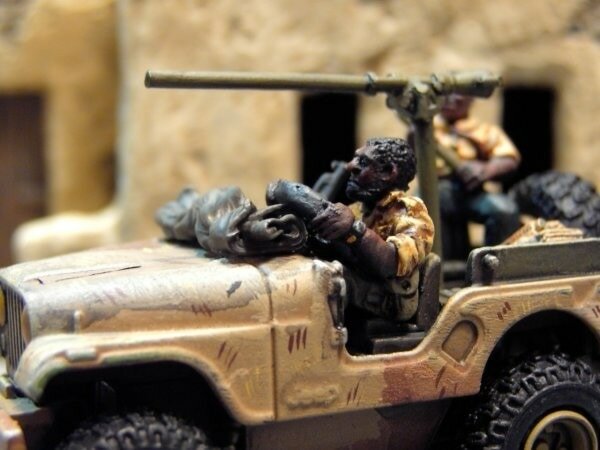 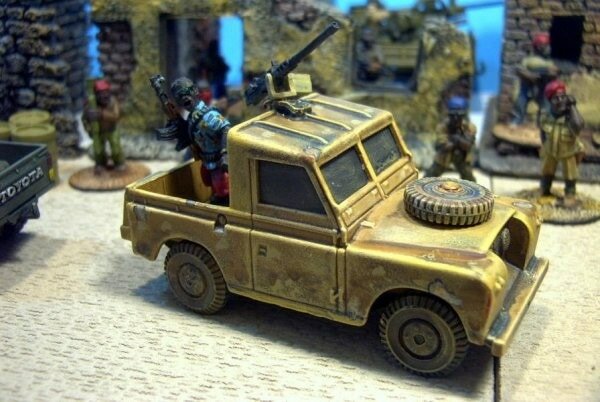 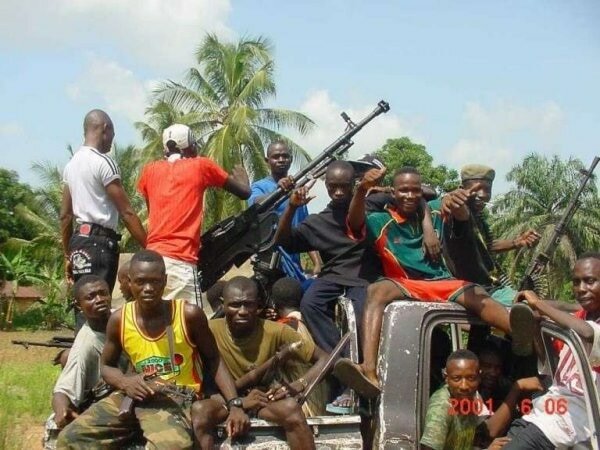 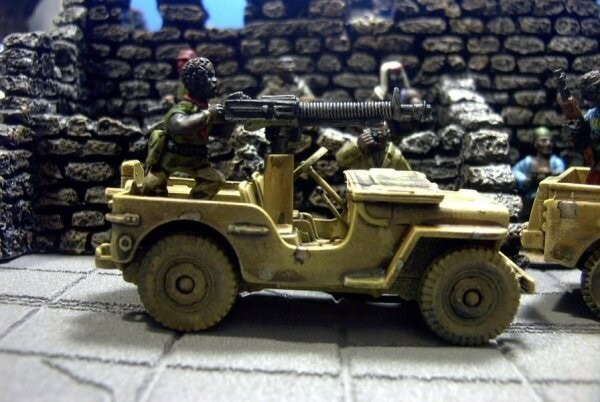 ​Additional crew figures and drivers were needed so I purchased several sets of the Britannia Congo Mercenary jeep crews and proceeded to cut off the heads of appropriate drivers and other crew and then add the heads from TAG and FoA figures. 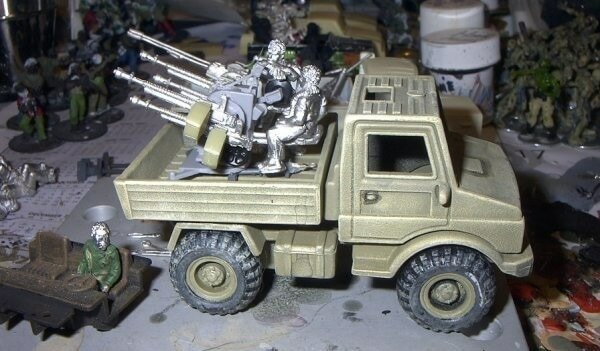 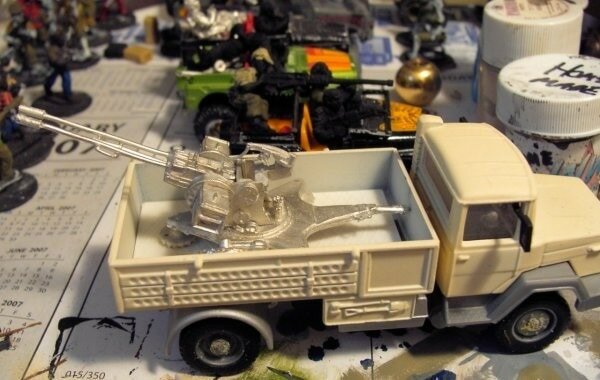 ​I also purchased a French version of the Unimog from Quarter Kit in France to use as a guntruck, in addition I bought a brass 37mm barrel to use in a conversion of a 1/35th scale German AA gun to a 1/48th scale Russian AA gun. 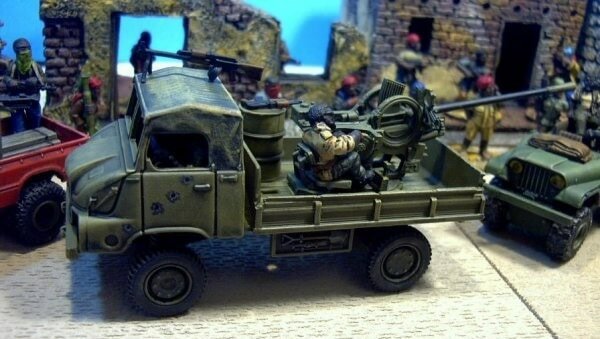 It didn’t turn out too bad (the gun) but now it would be easier to buy a single 37mm Soviet AA gun from Quarter Kit. 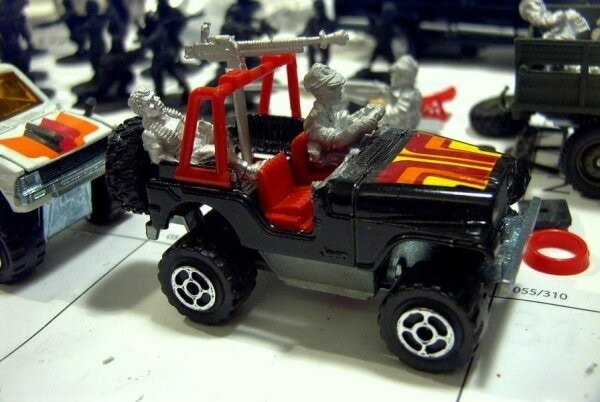 Another thing, I replaced the tires on the technicals with tires I got from 1/35th scale ATVs that I bought at Wal-Mart. 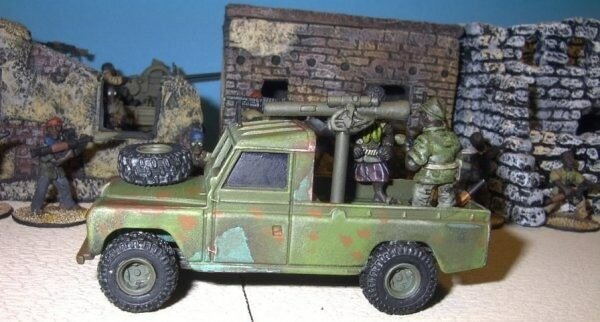 The tires on the Majorette vehicles were the usual hollow plastic toy wheels and I wanted the FoA Toyotas to match. 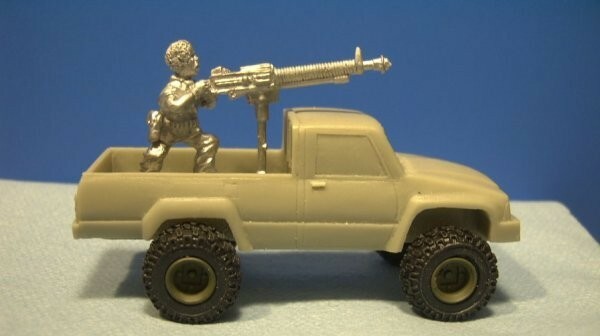 I don’t believe that Wal-Mart has these anymore but there are several other toy vehicles that would be able to supply the tires you want, you just need to do some (OK maybe a lot of) digging. 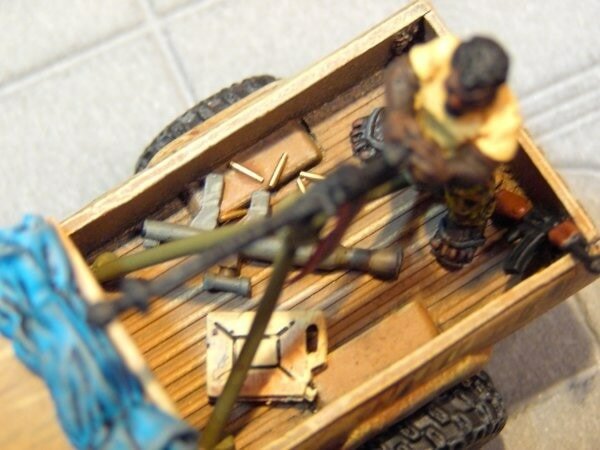 The ammo belts and tools came from Eduard photo-etch sets that I bought on E-Bay and from The Squadron Shop. 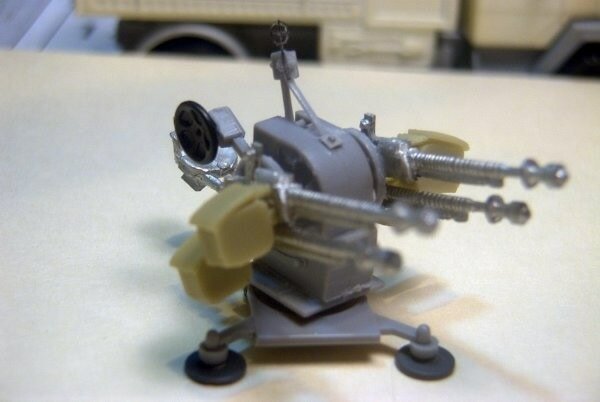 The same goes for the various gun sights. 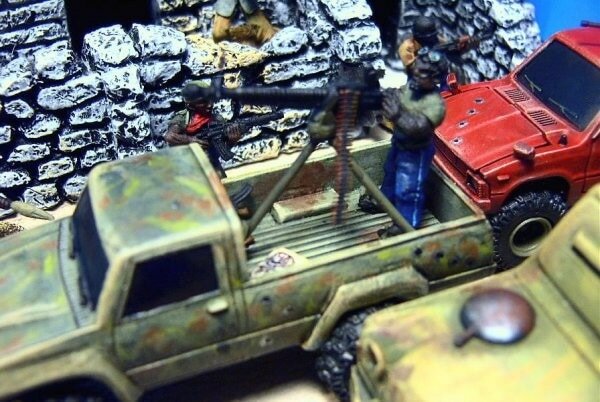 The third batch was a little more ambitious for me as I was going to scratch build a quad 12.7mm HMG for one of the technicals and also have more crew per vehicle. 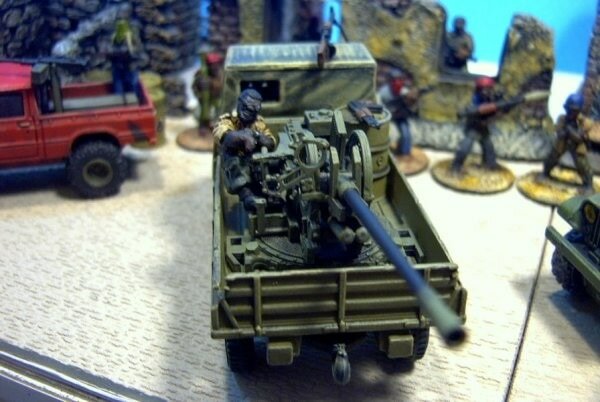 I purchased one of Sloppy Jalopy’s excellent ZSU-23 AA guns for one of the guntrucks and purchased 4 of FoA’s 12.7mm HMGs along with a 1/72nd scale German quad 20mm AA gun to use as a base. 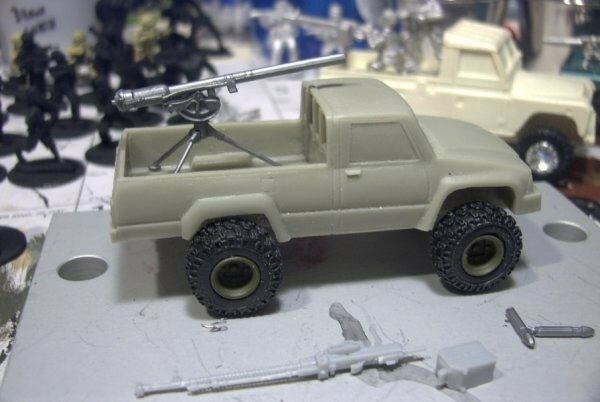 After fiddling with it and adding and subtracting parts, I came up with what I thought was a fair representation of the M-58 mount. 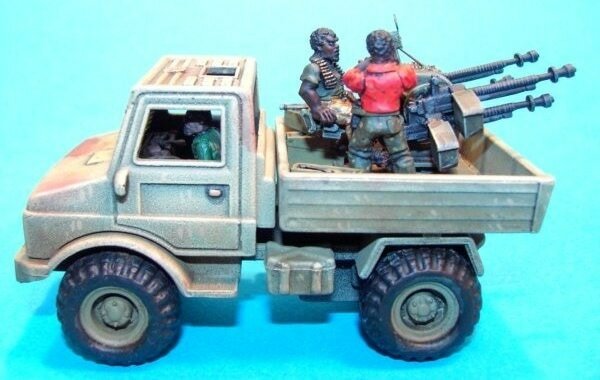 I dry fit a crewman to it and then dry fit the whole thing into a UNIMOG I had acquired from an old toy set. 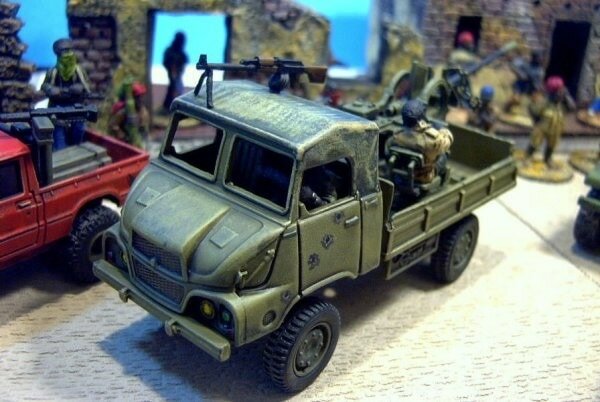 I painted up both trucks, one in a sort of tan and the UNIMOG in a faded OD or khaki. 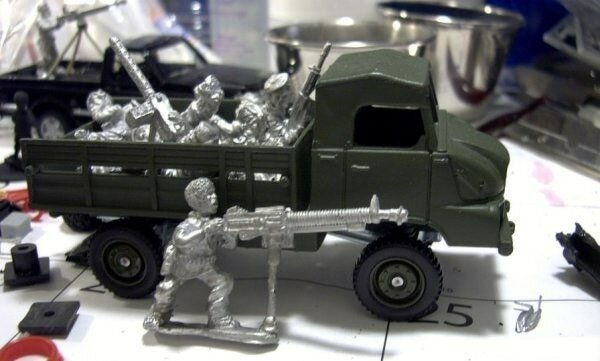 I used several of the excellent Technical Crewmen from FoA for the crew of both trucks, with the exception of the UNIMOG which had a driver cobbled together from a 1/48th scale helicopter crewman and a TAG head. 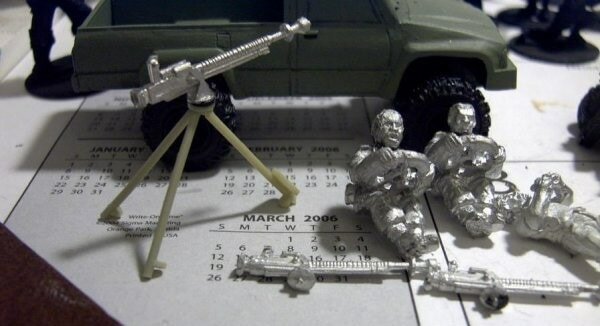 Once again, the photo etch came from Eduard and the personal weapons from FoA and TAG. 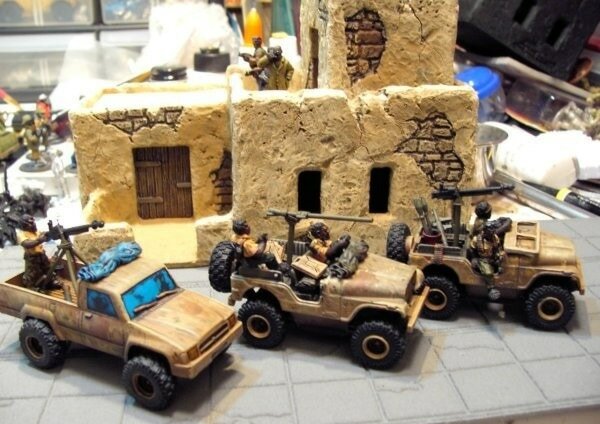 There is another batch waiting on the table, a Land Cruiser, a Toyota, and two UNIMOGs. 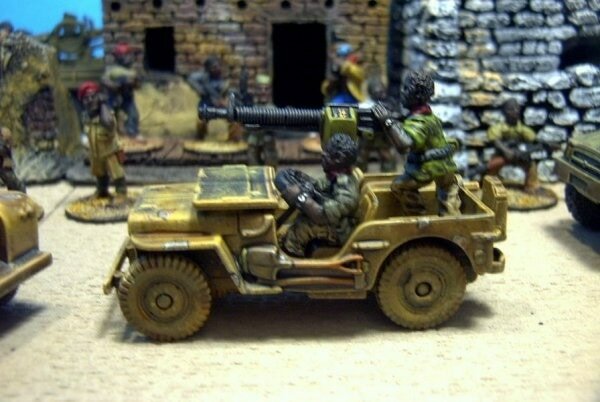 One of the UNIMOGs will be getting a twin 37mm AA gun while the other will be getting a ZSU-23. 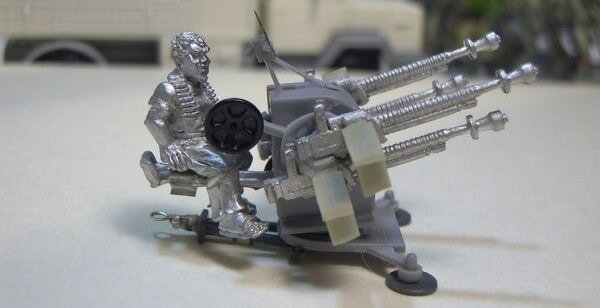 But that is for another day. 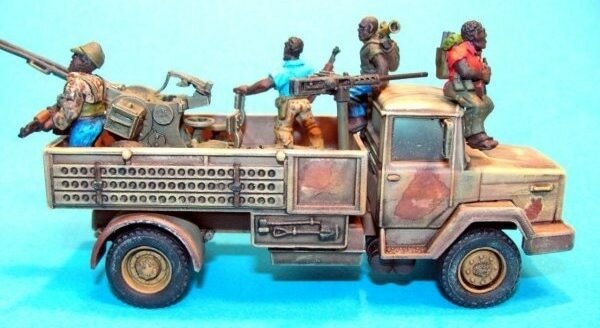 Along with Technicals in a Post Apocalyptic World. 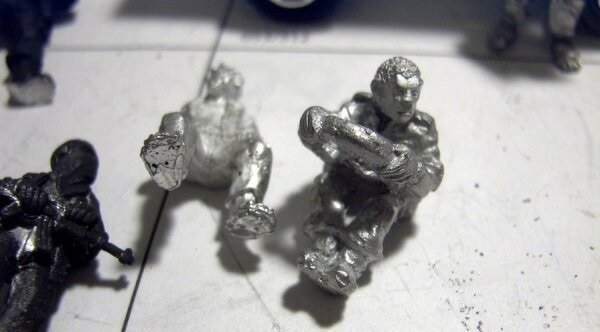 ​I hope this was of some help.